Damien is a Lead Project Engineer with over 15 years’ experience in Mechanical & Electrical Building Services Design and Supervision. Damien is renowned for high profile Mechanical and Electrical Services Solutions and has worked on a number of major projects for the Irish Prison Service such as Portlaoise Prison and the recently completed New Cork Prison. Damien has also completed a number of projects on the Campus of Maynooth University. He was a key design team member in the award winning John Paul II Library Extension, the Eolas Building, the Education Hub and the Iontas Building. Damien has practical experience in working with projects teams and is proficient in dealing with clients and contracting authorities. 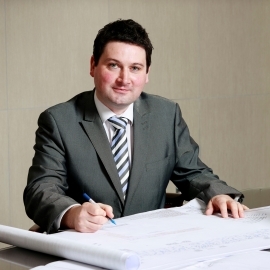 Damien's previous experience also includes compentence as a Senior Electrical Engineer on the Redevelopment of St Vincent’s University Hospital, Elm Park, Dublin.